...Molestia's heart grew ten times they say. I really see Fluttershy just gumming Molestia's works up. Rofl! Ah, the power of Fluttershy! Her stare can break even Molestia. 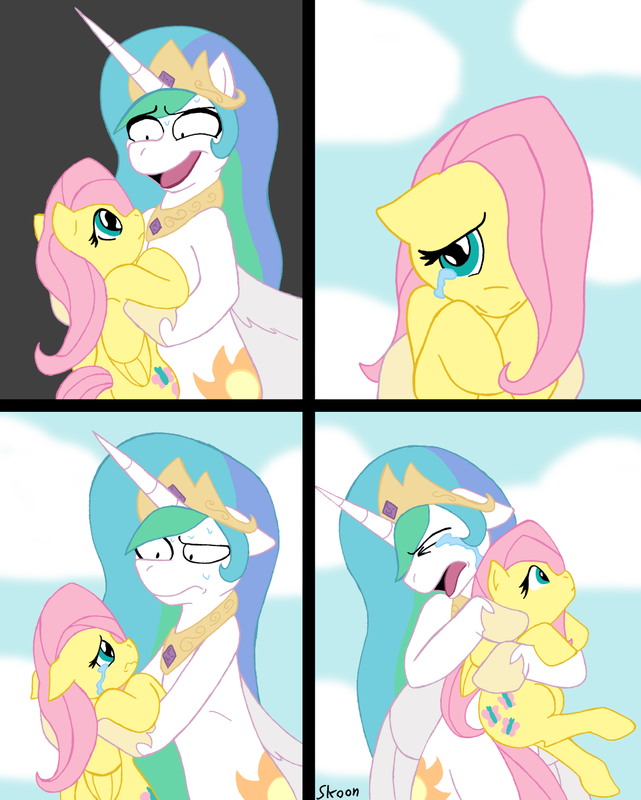 Even Molestia can't resist Fluttershy's cute. What are some of the others that Celestia has living in her brain? I have seen Molestia and Trollestia. Is there a Leonidestia that speaks in all caps and dines in hell or an Imerfect Cellestia that's A CHARGIN' MAH LAZOR? Tyrant Celestia, Rickrollestia, snufflestia, uhhhm... I'm sure there are more. I'm creating one of my own too. Snufflestia? LOL! Does she make Luna dress as Big Bird? after reading the story it this becomes even sadder. They do go hand in hoof don't they? story what story? I wants to read the story too, pleas share. yes, it grew ten times as big and then exploded. and since this day luna became the queen of all ponys. THE END! Why do I see this making Molestia even hornier? Why do I see this making Molestia even hornier? "*Want*, but ......*CANT*! DX"
one pont Molestia can't molest!Its a miracle!! Molestia reformed that day. From then on she would give a five second head start to her victims..
is it wrong that i would off myself as a distraction and let fluttershy escape while letting Molestia have guilt free fun?